The intention of this whitepaper is to provide a guide for decision making on how to use InterBase. It should give you assistance to purchase the right licenses and help with your installation. We will provide an overview of the different versions, editions and required licenses. We have also provided some InterBase tips and tricks about the installation and integration into your applications. The InterBase server implements a Multi-Generational Architecture (MGA). MGA provides unique versioning capabilities that result in high data availability for transaction-processing, users and decision support users simultaneously. The InterBase MGA engine performs well for short On-Line Transaction Processing (OLTP) and excels in real world applications, outperforming other databases in concurrent long-duration, decision-support transactions. The versioning engine eliminates the need for transactions to lock the records they read, making them contention-free — so readers never block writers. Unlike other databases, InterBase provides a time consistent, repeatable result for every query without special programming. The result is maximum throughput for all customer transactions. The InterBase Developer edition has already been provided free of charge for years with the development environments Delphi, C++Builder, JBuilder and C#Builder. This edition is exclusively applicable for the development process. The license may not be used in a production system. This version supports up to 4 processors with up to 80 parallel database connections. For larger test systems it is possible to request a 90 days test license with 4 CPUs and an unlimited number of users. See also InterBase Trial. The Desktop Edition of InterBase is a high performance, favorable deployment solution for the development of independent applications. Compared to the InterBase server edition it has the full database functionality, with the restriction that it allows no connections for clients over the network and that it is available only for Microsoft Windows. Ideal areas of application are e.g. mobile or single user applications. The InterBase Desktop Edition and the application must be installed on the same physical computer. Database contents can be exchanged at any time by a backup / restore process between the desktop edition and server edition. Thus the database can be scaled for different customer requirements. The Desktop Edition is low-priced solution with full InterBase functionality e.g. stored procedures, triggers, user defined functions, SQL standard, crash recovery etc.. The InterBase Server Edition is used in a multi-user environment. Once installed you will have all required components/licenses including one user license. The number of users accessing the server at the same time and the use of the resources can be increased by adding further licenses. The Server Edition can be installed in multiple instances on the same computer, this makes for a more flexible server environment. The InterBase Server Edition is the right choice for applications with complex business logic and many concurrent users accessing the database. This is obtained by the support of multithreaded architecture and the multiprocessor ability. The Server Edition is available for the Microsoft Windows, Linux and Sun Solaris operating systems. 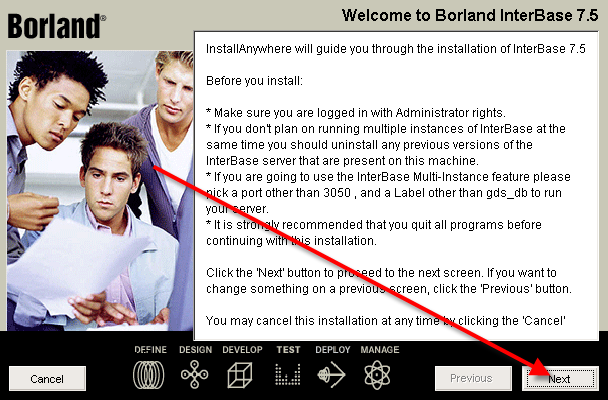 You can download an InterBase Trial Edition for different operating systems from the Borland homepage. A free Borland Developer Network account is necessary. An appropriate test key with limited number of users and CPUs is sent automatically to its registered e-mail address (see product activation). If you should need a test environment with 4 CPUs and unlimited number of users, please contact your local sales office or Borland sales partner. Apart from this restriction, the Trial Edition is fully functional. 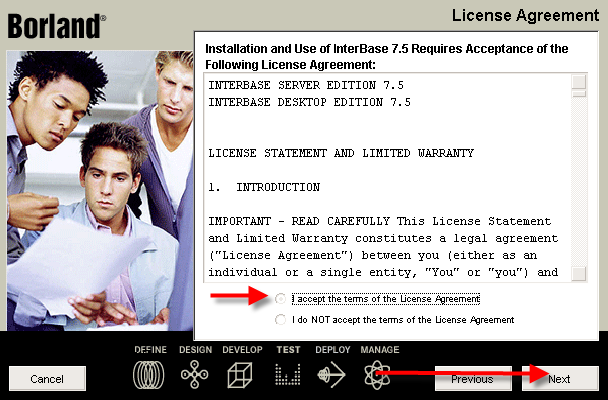 In the following section you will find details of the InterBase 7.5 licenses available at present. This corresponds to the products you can order through Borland and its partners. 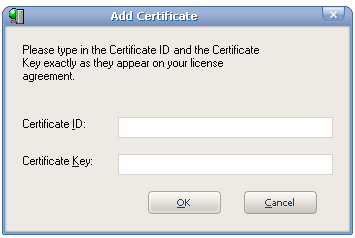 License card with Certificate ID and Certificate KEY. (no Sanctuary registration process necessary, the license needs to be registered with iblicense.exe or with IBConsole). The additional processor license is necessary if the database server is installed on a multiprocessor system and this/those additional processor(s) want to be used. The first processor will be activated with the server license. The use of each subsequent physical processor (also dual core) requires a processor license. License card with label containing serial numbers for use in the Sanctuary registration process. After the activation the InterBase server accepts an unlimited number of simultaneous users. One CD for installation of the Desktop software on Windows only. After activation, the InterBase desktop includes a two user access license. That access is possible only from the same physical computer. To sell your applications with InterBase desktop as embedded database, you can order additional deployment licenses. These are available in 20 and 100 user deployment packs. 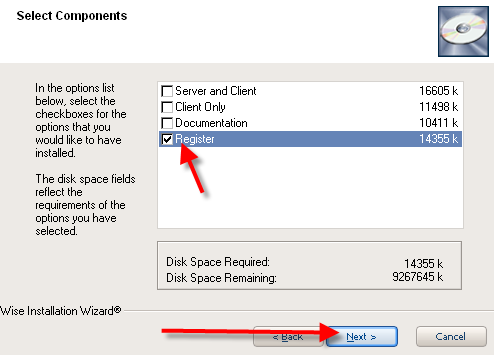 After you purchased the desktop deployment licenses, an activation file must be provided by Borland. This will be given to the developer to embed it with their application. In this case the customer, or final application user, does not have to register and activate InterBase. InterBase Value Added Resellers (VARs) are software development companies who will embed an efficient and scalable database server into their applications. If you are a developer for new or existing applications with new technologies, InterBase will offer you a very flexible and modern database environment. As an InterBase VAR you will be part of a program which supports your individual requirements regarding software development and selling. By choosing InterBase you and your customers will receive a database simply to use and maintain. InterBase offers not only excellent performance it also supports all important operating system platforms. No registration and activation necessary by the customer or end user. If you are interested in a VAR contract with Borland to sell InterBase with your application, please contact your local Borland office or sales partner. In general you must differentiate between two kinds of keys. The product activation keys and the internal InterBase key. During the installation process a registration assistant will lead you through the process of the activation. During an online registration the product is automatically activated by input of the serial number / authorization key. In case of telephone activation you have to enter an activation code given to you by a support person. With the registration by email you will receive a file (regXXX.txt) that activates your product. In order to complete the product registration, you must store this file in the product home directory. Detailed information is in the sent email. These keys are responsible for the internal functionality, the access rights and for extensions of your InterBase server. As an example these internal InterBase keys are printed on the license cards to increase the maximum user count. The internal InterBase keys are supplied in different ways. During the product activation of the InterBase server, the internal keys that serve for activation, metadata, client capability and remote access (only for the server edition) are generated automatically. Even with the Desktop Edition you can add further desktop licenses if necessary to increase the number of local users or the amount of parallel database connections. After the installation of the desktop edition you have two user licenses available. Here you can enter the appropriate (internal) InterBase Keys. You can find additional information and a description about the command line tool iblicense.exe in the Operations Guide “Chapter 7 Licensing”. Since InterBase version 7.1 it is possible to add a license with an unlimited number of users. This license replaces the server license supplied with the product and must be activated the same way. If you make a new installation of InterBase server you should use this unlimited license key instead of the server license key for your product activation. If you would like to extend an already existing InterBase server to unlimited access, you first must stop the InterBase server process. Afterwards you rename the file borland.lic in the Interbase directory and restart the installation assistant from the original CD. In InterBase version 7.5 the installation assistant was replaced due to the embedded installation in an internal release (see below). In the next windows please choose the appropriate path to your existing InterBase Server installation. 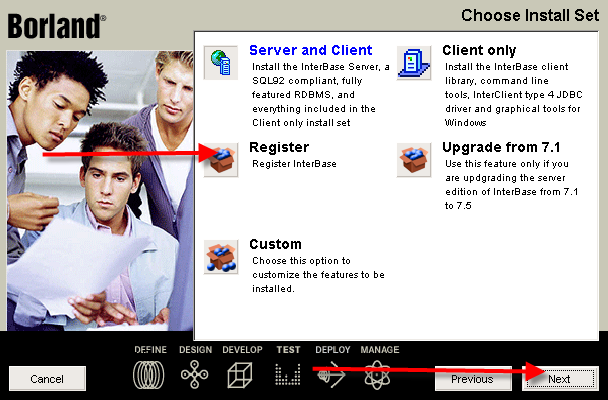 Please choose an option for your existing InterBase server installation. Please deactivate all options except „Register“. This option installs the complete InterBase server and client. 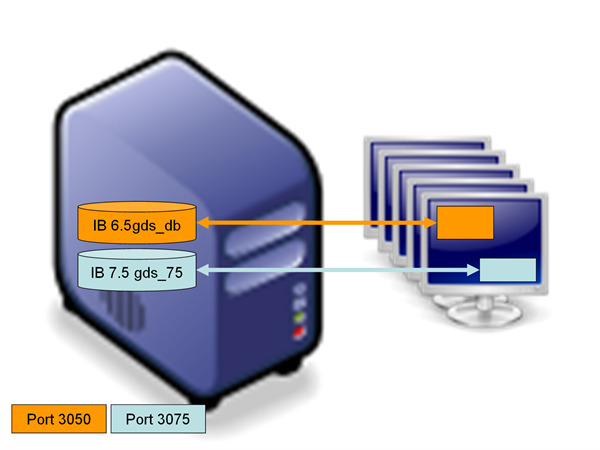 Since version 7.5, InterBase is able to install and start several parallel server processes on the same computer. If you don’t have an InterBase server installed on your computer so far, and this will be the only installation on the target computer please select Multi instances "NO". If you have InterBase (4.x, 5.x, 6.x, 7.x) already installed on your computer and still want to use it, you have the possibility to configure the multi instance installations. 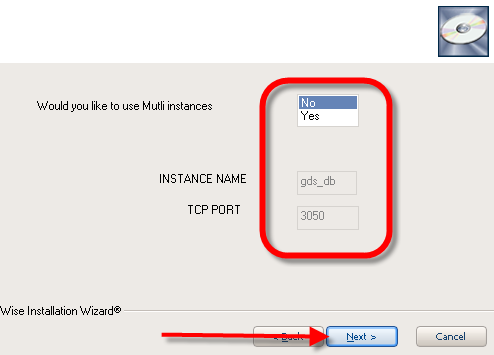 For this you select the option Multi Instance "Yes", enter a free port number and give the instance a new name. Earlier versions of InterBase and single instance installations use the standard port number 3050 and the instance name gds_db. 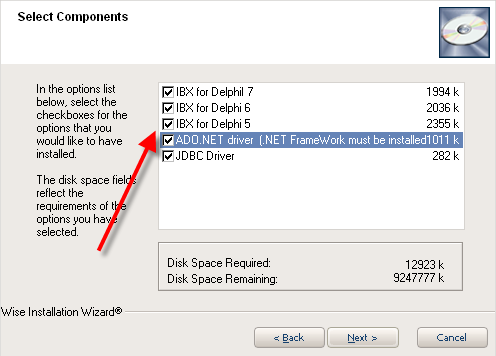 For a multi instance installation you have to give new values. You have installed an InterBase 6.5 server on your machine. Additional to this you want to run InterBase 7.5 in parallel. 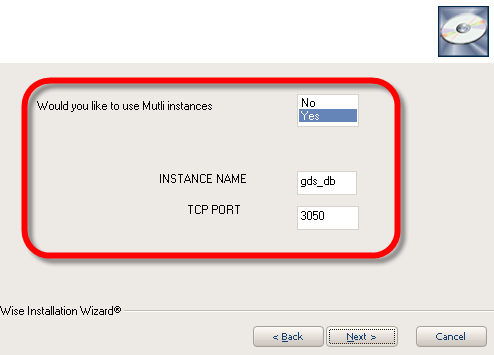 Choose the Option Multi-Instance to „Yes“, Instance Name for example. „gds_75“ and the Port 3075. This has the advantage that existing applications will still run with InterBase Server 6.5. 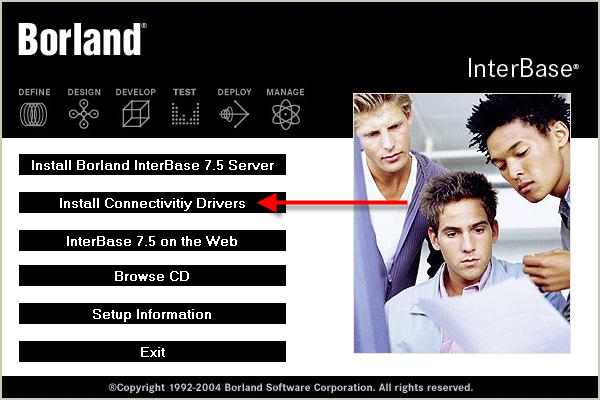 If you want to have access to the new InterBase 7.5 Server you have to use the connection string: computername/gds_75:c:\data\database.ib. With the addition of „/gds_75“ after the name or IP address you will not talk to the default InterBase port, but to the new defined instance from InterBase 7.5. This option is available for the desktop and the server edition. The installation will automatically enter the service name and the port to the services file of the operating system (for Windows C:\WINDOWS\system32\drivers\etc\services). Computers accessing InterBase over the network need the InterBase Client API files installed. With this option you can install the appropriate files on the computers. In the installation menu you have the possibility to install drivers for different architectures like JDBC, ODBC, ADO.net and the current IBX versions for Delphi and C++Builder. Install a configuration on a test system with the appropriate InterBase keys and the appropriate number of users you want to pass on. This configuration stores InterBase into the file ib_license.dat in your InterBase directory. You can use this file to copy it during the embedded installation process automatically into InterBase target directory. A symmetric multiprocessor system (SMP) is a multi-processor architecture, where the current running processes is distributed on all available processors. InterBase has supported this option since version 7.0. With multiprocessor machines, e.g. 2*Pentium 4 or dual core etc. you need additional processor licenses to enable the use of the additional processors. If you have InterBase running without a additional processor license on 2 a CPU machine. Use the second processor, since other programs mostly use the first processor. Therefore the switch CPU_AFFINITY in ibconfig need to be changed. You have two processors including HT. Use both processors and enable HT. Because of the emulation of two additional processors (HT) you get performance similar to a machine with 3 physical processors without HT. User with a three processor machine that did not purchase an additional processor license for their windows server edition operating system from Microsoft should configure InterBase to run on the third processor. MS Windows Server and Windows XP normally only uses the first two processors if no additional licenses are installed. If you would like to leave the old version still on your server, please install as multi instance as described above. 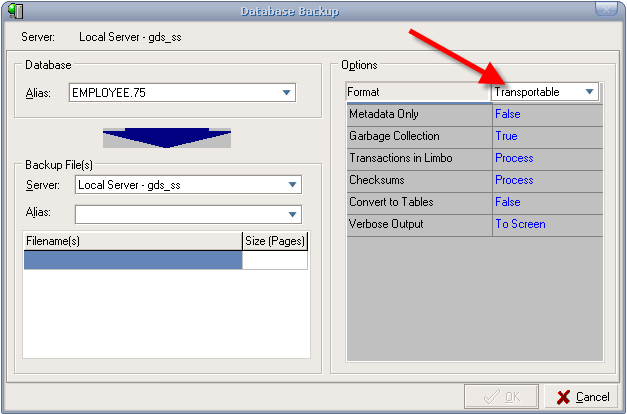 Backup your database with IBConsole or gbak tool, see also: "Chapter 8 DATA using Backup and Restore" in the operation guide. 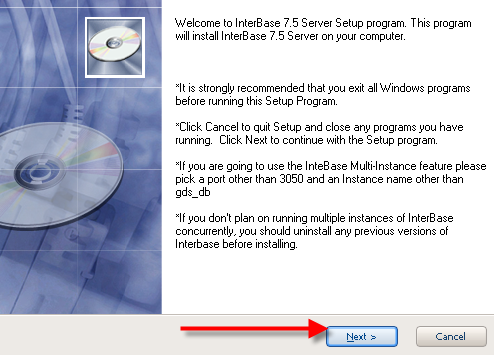 Uninstall the "old" version of InterBase. An uninstaller program always removes only those files and entries which where installed at the beginning. After removing the program there can still be some files left in the directory, since some InterBase files where added e.g. log files. Therefore you have to delete these by hand. Backup and Restore are necessary for older InterBase versions with different ODS (on disk Structure) versions. Not all old database versions can be read by newer InterBase versions. Especially with the change from InterBase 7.1 to InterBase 7.5 there was a new ODS implementation implemented by the InterBase developer team! Another big advantage of a Backup/Restore process is the rebuilding of the index trees, which leads to increased performance. In general any backup files can be rewound from earlier versions, if they were created in the transportable format. If you want to update InterBase 7.x to InterBase 7.5, then save your iblicense.dat before uninstallation. After the new installation copy this file back into new InterBase directory. Thus you save time entering the InterBase keys. How many database connections are allowed for each Simultaneous User Licence in IB 7.5? is it 1 or 4? Many thanks to Roland for this excellent article. It is about time Borland does something to begin promoting InterBase! I don't suppose it is worth mentioning that Firebird provides a nearly identical experience (with a few differences many may consider improvements), but is also free?